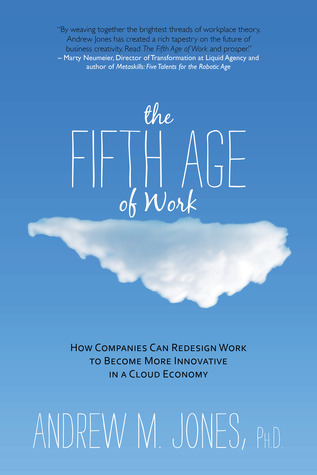 The Fifth Age of Work by Andrew M. Jones re-examines the building blocks to organizational transformation and gives us something wholly new. Inspired by the coworking movement and design thinking, Jones offers an out-of-box guide for business managers and decision-makers that recommends focusing on three areas: new talent (specifically bringing in outsiders), redesigned workspaces (better design offices more like coworking spaces), and work mobility and policies (give employees the license to innovate and to make autonomous decisions). The most innovative part of the book are the solutions on how to integrate freelancers and independent professionals into a corporate workforce. A must-read. Andrew M. Jones - Andrew M. Jones, Ph.D. is a cultural anthropologist turned management consultant and business school professor. He has taught at management schools in the U.S. and the U.K. and has consulted with firms in numerous industries over the past fifteen years. He is a partner at Conjunctured Coworking in Austin, Texas and teaches Management and Organizational Behavior in the McCoy College of Business Administration at Texas State University. He has published two previous books, The Innovation Acid Test: Growth Through Differentiation and Design (Triarchy Press, 2008) and I’m Outta Here: How Coworking is Making the Office Obsolete (NotanMBA Press, 2009) with Tony Bacigalupo and Todd Sundsted. Andrew is also a 2014 winner of the Management Innovation eXchange M-Prize for his work on business innovation and coworking. He lives in Austin, Texas.To learn more about Andrew's work and research, visit drewjones.